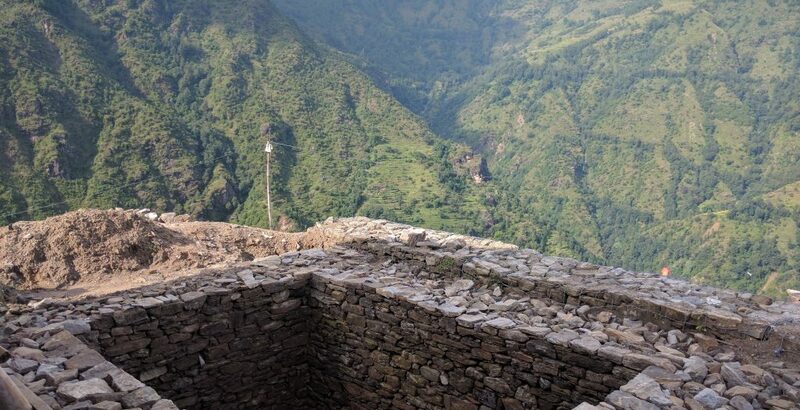 Louisa Ingham, a recent volunteer at our projects in Nepal, talks us through her exciting adventure in the Helambu valley. At dawn on Wednesday 5th October Chiring, Mohan and I set off on motorbikes to visit Shree Pating Basic School in the Helambu province to check on the progress of the new school being built there, as well as to meet with the village committee to inform them of the amounts spent on the building work so far. As HELP’s Operations Manager and Volunteer Coordinator respectively, it was clear that Chiring and Mohan had much experience of this sort of trip from their friendliness with the villagers to their knowledge of the local area. After the most stunning three hours of biking through the mountains passing waterfalls, bursting rivers and lush green crop fields, as well as sampling my first proper Nepalese breakfast on the side of the road, it was impossible not to notice how many villages had been affected by the earthquake – even more strikingwas seeing the efforts the villagers had taken to piece their homes back together over the last year and a half. 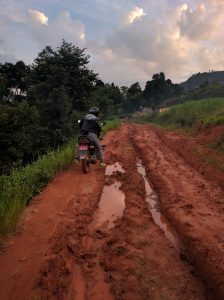 As we travelled further from the major towns, the roads became worse and worse and we had to abandon our bikes in a small village whoseresidents said that the previous night’s downfall had made the rest of the road totally impassable, even for a motorbike. 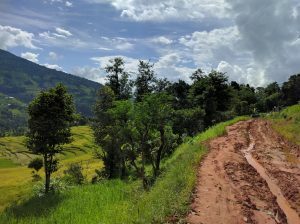 The monsoon should have finished by the end of September, but this year seems to be an anomaly – in my short time here I can only describe the weather as ‘highly unpredictable’ – bright blue skies followed by a severe downpour is the norm! After a tiring three hour walk uphill (I was grateful I’d climbed Kilimanjaro not long before!) passing through many small villages, we finally made it to Shree Pating Basic School. The school runs from ages 3 to 17 with approximately 260 pupils, located on a terraced hill at an altitude of 2000m. 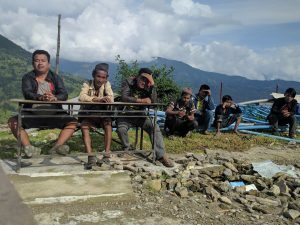 Populated mainly by the Tamang community, the school’s catchment area has roughly 300 households with around 2000 inhabitants. The school currently has 8 teachers (6 are government funded and 2 are privately funded). The majority of textbooks are in Nepali, and the lessons are mostly conducted in Nepali. The new school building was impressive: a two-storey building with four classrooms on each floor built in accordance with the Nepali Government requirements (as earthquake-proof as possible). 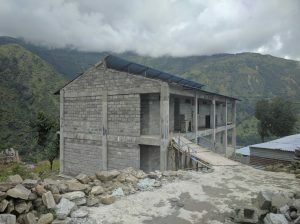 Stairs are yet to be built on each side of the main building which will be completed when supplies are able to reach the school after the monsoon season ends and the roads are cleared. The bathrooms were in a separate block with six individual cubicles for the girls, another room for the boys, all flowing into a cesspit which was well removed from the school building. There are further plans (funding dependent) to put a dividing wall around the cesspit, making it fully removed from the school, to erect a fence around the entire school campus for safety, and to build two further classrooms using the truss of JICA Model Building. After some delicious noodles cooked for us by one of the villagers, a meeting was held with the village elders, the school management committee and the secretary of the village development committee (who happened to be giving out pension money at the time!). Chiring talked through the amounts that had been spent on the building work from the start of the project to the end of September and how they had been allocated. He explained what was yet to be done and asked for the villagers input as to how they thought the work was going. I asked the committee what they hoped the school would represent for generations to come and how they thought it would change village life, if at all. The village elders were keen to respond saying that their dream was to make the school go up to secondary level, upgrading educational values and advancing education in the village generally. When asked where HELP could provide assistance in the future (funding dependent!) the villagers said that the presence of a long-term volunteer could really help the children and would, in particular, benefit the teachers and the techniques used in the classroom. A short-term volunteer is of course of value, but it is those who stay for a significant period of time (a few months rather than weeks) who can encourage the best response from both children and teachers. The villagers also said that the presence of more HELP-funded teachers would make a huge difference to the quality of teaching in the school. It was an incredibly successful meeting, with around 40 people in attendance. The villagers were keen to hear the updates from Chiring and clearly take a great interest in the future of this school. We left feeling that things were certainly progressing in the right way and bounded down the mountain in a mere two hours to where our motorbikes were! After another locally made noodle dish (made with real black beans – something I had only seen in jars!) we started the not-so-easy four hour motorbike journey back to Kathmandu in the pitch dark, attempting to avoid slipping in the endless mud patches we JUST about succeeded.